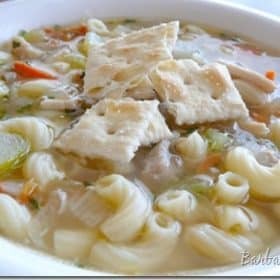 I was never really satisfied with a chicken noodle soup recipe until I found Pam Anderson’s Soup Up Your Chicken Soup article on Allrecipes. Most of the recipes I’d tried before were okay, but didn’t have enough chicken flavor. Or, if the flavor was great, it was so time-consuming that I wouldn’t bother making it again. I tested a chicken soup recipe a while ago that tasted fabulous. But it involved hours of work and lots of different steps. It even required you to cut the chicken bones into one inch pieces so you could get every bit of flavor out of the bones. What a pain! This recipe starts with a rotisserie chicken and chicken broth. It cuts hours off the cooking time. You don’t have to chop two sets of veggies and throw the first set away. And best of all, It tastes as good or even better than if you’d spent hours making. My adapted version is listed below, but in her recipe Pam has a chart of add-ins to make different versions of chicken soup, such as curried chicken soup, or chicken tortellini soup. When my son recently had his tonsils removed I made him the chicken and rice soup, which was the perfect comfort food! Separate chicken meat from skin and bones. *Reserve meat. Bring broth and water to a simmer over high heat in a large soup pot. Add skin and bones to the simmering broth. Reduce heat to low, partially cover and simmer until bones release their flavor, 20 to 30 minutes. Strain broth through a colander into a large container; reserve broth and discard skin and bones. Return pot to burner set on medium-high and add oil, then onions, carrots and celery. Sauté until soft, about 8 to 10 minutes. Add chicken and broth. Bring to a simmer. Add noodles and cook until tender. *I always buy one of the big Costco or Sam’s Club rotisserie chickens. I use the dark meat for the soup and save most of the breast meat for making something like BBQ chicken sandwiches or chicken tacos. It looks wonderful! My mom made something like this when we were growing up, but she added milk to make it creamy, and some bell peppers too.I'm definitely making this soon. I would love some chicken soup right now to warm my frozen bones. It looks delicious. Barbara, what a terrific new look to your blog; so professional looking! Wow! And that chicken soup…I'm with you. If there are too many steps I don't like it, and I've also had trouble finding one with enough chicken soup flavor. Wonderful new blog!!! And that 2nd photograph looks perfect and yes this recipe is so simple and quick yet gives the maximum flavour bang for your buck – it is a very clever use of a cooked chicken. And yes chicken and rice would be perfect for a sick boy. And thank you for your support and kind comments on my blog. Cheers from Audax in Sydney Australia. Barbara, I love your new look! Chicken soup is so comforting, what a great idea to use the precooked chicken. Looking forward to connecting this week. I love your new blog. Wowsa! Yep, very professional! But you know, your recipes are the same as always…good, dependable and comfortable to make…like an old pair of shoes! Grin. I like your analogy Barbara! Thanks for all the sweet comments on my blog redesign. I'm so glad you like it! It's fun to have an update. It's like getting a cute pair of new shoes, only better! love your new site!! You will have to fill me in on how you did it! Like your new look:) I love homemade chicken soup…especially a favorite of my husband:) This one sounds like a goodie!